As far as I’m aware, most sensible folk only cross glaciers to get to the mountains beyond. Painting ice, however, is one of my great passions, and as glaciers contain rather a lot of the stuff they tend to be something of a magnet. Ice can be formed into the most fantastic and surreal shapes, with a wide range of glorious colours, from blues, greys and greens to yellows and even orange on occasion. Getting down into the awesome crevasses and under the ice brings even greater rewards, as looking out through ice formations can accentuate the intensity of the colours, seeing light through translucent ice. 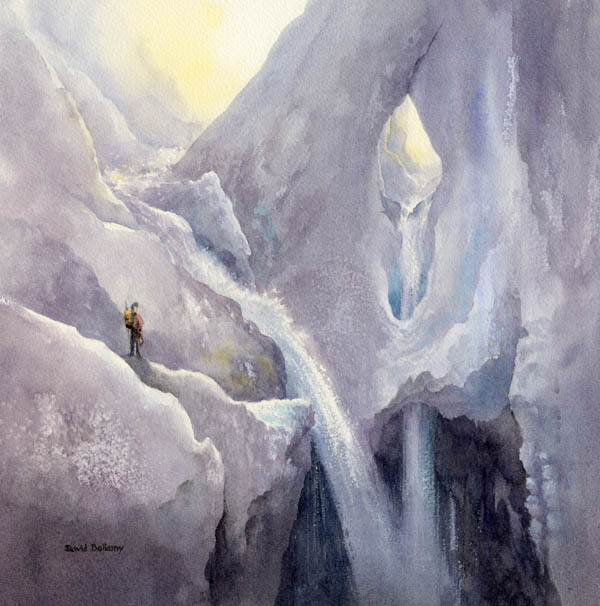 In this watercolour of a moulin on the Greenland ice-cap my biggest problem was to show scale. There was no room for anyone to stand safely to put them in the picture to suggest the vast size of the place, so the figure had to be added in the studio. I had made notes on the original sketch to indicate size. To create texture on the ice I flung sea-salt into the wet washes, and you can see the results in the bottom left-hand corner and in the centre between the two falls. I’ve moved some of the ice shapes around to improve the composition, and slightly warmed up the colours in places by mixing cadmium red into the ultramarine. When seeking out places like this I find it is well worth employing a local guide who knows where these features are. It’s all too easy to miss them by 100 metres and wander around all day finding nothing. It also allows me to concentrate on the painting. On this occasion I hired Kim, a guide with World of Greenland expeditions, in Kangerlussuaq: see http://www.wogac.com/ Oh, and don’t try this sort of thing unless you have the experience plus experienced companions or a guide………….it’s rather dangerous.